6/14/2013 – SIGMA has announced that this lens will sell for $799 which is far less than I expected it to sell for. It will be available for Sigma, Canon and Nikon mounts with Sony and Pentax to follow. The lens will start shipping in early July. 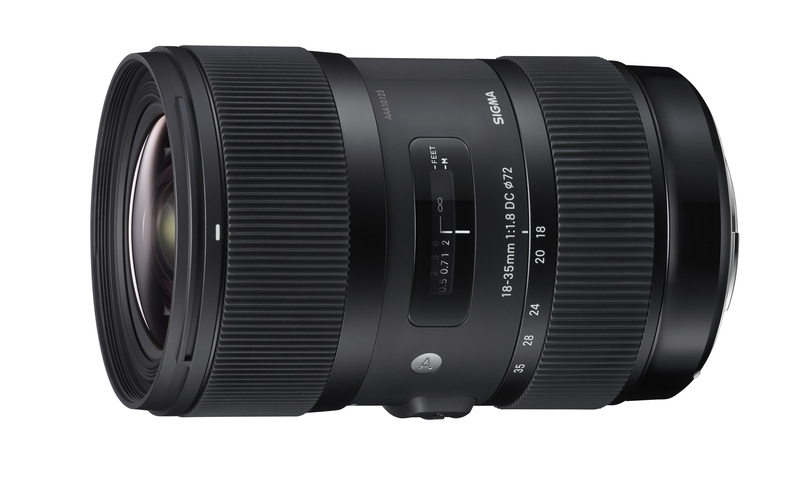 Sigma just announced a first of its kind lens, the 18-35 F1.8 DC HSM Art Lens. What is so unique about this lens is that fact that it has a fixed aperture of F1.8 all the way threw its zoom range. This lens is only for APS-C sensor cameras which means it is not meant for a full frame camera. The 35mm equivalent of this lens is 27mm-52.5mm at F1.8. This lens will be available for Nikon, Canon and Sigma mounts. There has not been a priced announced yet which leaves me with some questions. Will this lens be over $1,000 or will it be less? If it is not much less than a grand I can not see to many beginners purchasing it. The reason I say this is that many beginners just spent a lot on a camera body and don’t yet understand the importance that the glass plays. I am not sure how well it will sell as many pros have ventured into full frame at this point. If the price is right I could see this being the new must have lens though for all APS-C sized sensors. When this lens is officially released with more information on pricing I will be sure to bring you a full review from Allens Camera. RONKONKOMA, NY – Apr. 18, 2013 — Sigma Corporation of America (www.sigmaphoto.com), a leading researcher, developer, manufacturer and service provider for some of the world’s most impressive lines of lenses, cameras and flashes, today announced the Sigma 18-35mm F1.8 DC HSM Art lens, the market’s first zoom lens to achieve a maximum aperture F1.8 throughout the entire zoom range. This revolutionary, wide aperture, standard zoom lens is created for DSLR cameras with APS-C size sensors, which translates to a focal range of 27-52.5mm on a 35mm camera. With a minimum focusing distance of 11 inches, and a maximum magnification ratio of 1:4.3, the 18-35mm is ideal for landscapes, portraits, still-life, studio, close-up and casual photography. “Exceptionally fast apertures were previously unavailable in zoom lenses, so photographers turned to several prime lenses in a session to get bright images at various focal lengths. We’re incredibly excited to be the first manufacturer to bring the F1.8 standard zoom to the market and to provide photographers with a new level of creativity and convenience, with the outstanding image quality at the core of the new Sigma Global Vision,” said Mark Amir-Hamzeh, president of Sigma Corporation of America. Amir-Hamzeh added that because developing a large aperture wide angle zoom lens can prove to be technologically and optically challenging, often resulting in various distortions, aberrations and field curvature, Sigma has tapped into its long history as a lens pioneer to overcome those issues in this new generation lens. The 18-35mm is the latest addition to the company’s Art line of lenses, designed under the new Global Vision. The Global Vision lenses have a sleek new design with the manufacturing year stamped on the barrel, and are categorized by use into one of three groups: Art, Contemporary and Sports. The Art category delivers high-level artistic expression through sophisticated and abundant expressive power. The new 18-35mm lens incorporates Sigma’s improved AF/MF switch and the use of Thermally Stable Composite (TSC) compound material, which has a high affinity to metal parts, consistently performs well at extreme temperatures, and reduces the size and weight of the lens. It is also compatible with Sigma’s new USB Dock, which will be available in coming months, enabling photographers to update lens firmware and adjust focus parameters from their computers. Convenient handling is achieved with internal focusing and zooming, which prevents changes to the size of the lens. Additionally, the front part of the lens does not rotate, so special filters like circular polarizers can be used. The 18-35mm lens’ Super Multi-Layer Coating reduces flare and ghosting and provides sharp and high contrast images, even in backlit conditions. The petal-type hood that is supplied with the lens will provide extra protection from flare and ghosting. Sigma’s Hyper Sonic Motor (HSM) ensures a silent, high-speed AF function and the optimized auto focus algorithm results in smooth focusing and full-time manual focusing capability. Lastly, the nine-blade, rounded diaphragm creates an attractive, round bokeh at large-aperture settings. Minimum focusing distance: 11 in. For 50 years, Sigma Corporation’s expertise and innovation has driven the company’s core philosophy of “knowledge, plus experience, plus imagination,” with an emphasis on producing high-quality, high-performance photographic technology at moderate prices. This family-owned organization is the largest, independent SLR lens manufacturer in the world, producing more than 50 lenses that are compatible with most manufacturers, including Sigma, Canon, Sony, Nikon, Olympus and Pentax. Sigma Corporation also produces digital SLR cameras and high-definition digital compact cameras. The company is headquartered in Japan, with offices strategically located throughout Europe, Asia and North America. For information, please visit www.sigmaphoto.com.